The National Affordable Housing Network (NAHN) is building space efficient, super insulated homes that perform remarkably well in Montana’s serious winter weather with total energy costs for space heating averaging $250 per YEAR. 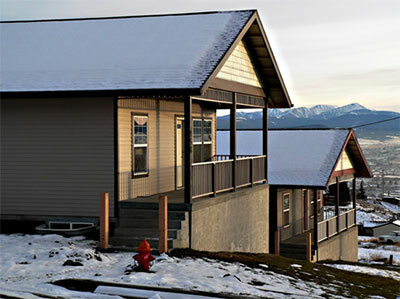 Based in Butte, NAHN is using innovation and its long experience in affordable single-family housing to design and build super energy efficient dwellings through the USDA Mutual Self-Help Housing Program. These two NAHN Model 1092 self-help homes include a full basement and 2,184 sq. ft. of living space, configured in 4bdr and 5bdr floor plans. The homes also have a commanding view from the Centerville neighborhood of Butte. Ceiling—Blown-in fiberglass to an R-60 rating. Underfloor—Fiberglass 16” batts to an R-30 rating (raised foundations and framed floors). Exterior Walls—In NAHN’s preferred method, exterior walls are built with 10.25” thick Structural Insulated Panels (SIPs) that give the walls an R-40 insulation value. SIPs are made up of an insulating core of expanded polystyrene sandwiched between and adhered to two layers of oriented strand board structural sheathing (see www.r-control.com for description). Alternately, the exterior walls can be built to the same R-40 value with a double wall of 2-by-4 studs (10.25” total wall thickness) with fiberglass or rockwool insulation. Doors & Windows—High quality Low-e value windows and R-11 value doors. Additionally an air and vapor barrier is installed throughout the exterior envelope. Along with efficient design (1,092 sq. ft. 3bdr home) and the super insulated and sealed building envelope, the other central energy feature in these NAHN designs is a whole-house heat recovery ventilation system. This system continuously exhausts stale, moist air from the home while recovering its heat to warm the fresh (filtered) exterior air continuously entering the system. NAHN is about to start construction of a self-help subdivision in Whitehall, Montana. The homes will be super insulated and solar electric panels will be added to generate all of the homes’ energy requirements, creating net-zero homes. Future reports will be posted to share the results of NAHN’s good work as an important innovator in energy efficient home design and construction. NAHN has its house plans for sale (2bdr, 3bdr, 4bdr) at a low price to encourage energy efficient home building—less than $250 per plan set. NAHN is of the clear opinion that its plans should be built as designed because the plans’ designs and energy features have been tried and tested as complete packages and proven to work. For more details about NAHN’s homes and plans go to www.nahn.com.